There has never been a better time to train our call centre staff. A pre-induction learning portal is proving to be an excellent tool to dramatically improve engagement and productivity of new staff from their very first day. Brightwave and Sky, the satellite television and media communications provider, worked together to build a pre-induction portal. Up to ten hours of learning covering product knowledge, compliance topics, as well as sales simulations, have led to staff arriving confident and competent. This has reduced induction training by one week and measurably improved sales and customer service performance. The portal also won the Most Effective Training Programme award at the recent Customer Contact Association Global Excellence Awards. It’s a best practice model well worth replicating. Take a look at this article to see how OVO have used this pre-induction orientation. In addition, you can help beginners to the call centre world to get familiar with the job, such as introducing them to the roles within a call centre and what they will face in the coming weeks. Of course initial training of agents at recruit level is important, but so is continuous training, which should ideally be more than just quality monitoring alone. 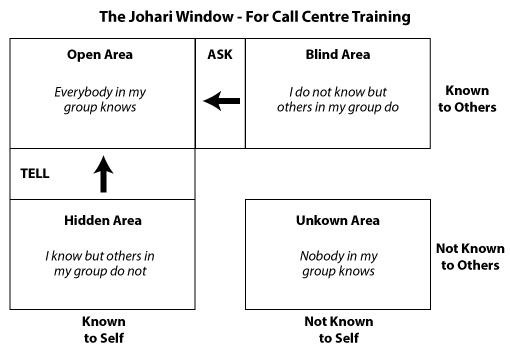 One training tool that can be used for continuous training is The Johari Window, an exercise that involves giving a group of 3-8 advisors a list of job-related questions and asking them individually categorise each question into the following grid. Once categorised, agents who have put questions in the “Hidden Area”, should TELL the other agents in the group, who did not know, the correct answer. Alternatively, agents who have put questions in the “Blind Area”, should ASK the other agents in the group, who did know, for the correct answer. If any questions are put into the “Unknown Area”, this is when the Team Leader should get involved and tell each advisor the correct answer. Dave Salisbury, an Operations and Customer Relations Specialist. Building upon the core psychology of communication “it is not what you say, it is how you say it”, the award-winning team at Lebara Limited have translated a vision to “make lives better” into a powerful operational culture. This reinforces an emotional connection with customers. Training staff to create this emotional connection with the customer makes for memorable customer experience. This emotional connection can also be achieved by using empathy statements that help to improve agent-customer rapport and by teaching agents to use positive words, whilst avoiding negative language, such as “no”. Being able to pinpoint the training needs for each individual member of your team can ensure that you are on course to having well-rounded agents in the call centre. Many operations are already using call and email assessments to check the quality of interactions, and a quality framework will allow you to schedule and track agent development activities. This can be done through a variety of coaching, eLearning and group training methods. Not fully convinced, then read this article on why you should Record Calls for Training Purposes. Popular video-sharing websites such as YouTube are a cost-effective and brilliant way to keep your call centre training sessions interactive, fun and engaging. These websites offer a wide variety of free video footage – everything from humorous clips showing the top ten ‘call centre disasters’ to more serious footage demonstrating examples of high-quality customer service techniques. These videos act as a great discussion starter for training sessions. Staff can be given time to find their own examples of good and bad practice and share their learning with the team. Online video clips can also help to inspire other, more classic, training techniques such as role-play. Managers can show examples of poor customer service from YouTube and ask staff to role-play the way they think the call should have been dealt with. Often training follows the ‘sheep dip’ approach where, regardless of knowledge levels or experience, everyone completes the same course. By assessing current knowledge levels you can target training to each person’s ‘gap’. This ensures that the training is relevant to the trainee, and ensures that the trainees are more engaged. For example, those that already have an excellent knowledge level might only need a refresh e-learning, those that have an average level of knowledge could receive a half-day workshop, leaving those new to the subject or lacking in knowledge taking the full 1-day workshop. In addition, you are able to spend the training budget smarter by delivering training that has a bigger impact on the business. Call centres are great at training agents to be generic performers, and then we expect the cream of the crop to rise to the top once the employees are in a production environment. We can lose a prime opportunity to encourage superior performance from the first day on the floor. Take a read of How to Deliver More Memorable and Effective Training. From a workforce management and operations perspective, it’s a great idea to get WFM (workforce management) folks into the classroom to sell employees on adherence and give practical tips on hitting KPIs. To build enthusiasm and make top performance an achievable goal, bring top-performing employees into the room to share their energy, passion and secrets for being the best in the business. You can give your agents an Introduction to Contact Centre Analytics. In short, don’t just train your employees by filling their heads with knowledge. Be sure to give them real-world advice and the encouragement they’ll need to succeed right out of the gate. Sometimes trainers aren’t in a position to do this. That’s why it’s so important to bring experienced representatives into the room to have candid conversations about their own successes. To build enthusiasm and make top performance an achievable goal, bring top-performing employees into the room to share their energy, passion and secrets for being the best in the business. One tip I’ve picked up over the years is just a brutal fact of business. If your trainers came up through the organisation at a time when the company wasn’t performing up to standards, then take a long hard look at them. Finally, make sure you recruit agents with exceptional behaviour and performance to deliver on-the-job floor training. Are they hitting adherence targets and any other KPIs? Or are they mediocre performers? These agents will directly influence your trainees in a big way. Something to think about! Think about implementing a buddy system or mentoring scheme, as discussed in this article on Making Mentoring Work in the Contact Centre. Be structured and let the delegates know what to expect, always engaging and ensurin everyone participates. A good way to do this is by following the POPEA structure highlighted below. P – Purpose: what is the purpose of the session? O – Objective: have a SMART objective up on display and refer to it during and after the session. P – Process: outline what is going to happen throughout the session so there are no awkward surprises. E – Experience: Understand the group’s current experience… 1 – 10 and use the people with more experience to your advantage while focusing on the less experienced to ensure they fully understand. Once the session is completed review the experience 1 – 10 and see if they feel the number has improved. If not, question why and ask for feedback and follow up. A – Apply: what are they going to do on the back of the session, how, and when? Ensure you have a lot of recap questions showing the session went well and everyone understood why they were there and what is expected of them going forward. A work shadow visit is part of our recruitment process for our call operatives. They are issued with a questionnaire at the start of their visit. This is used as part of the interview process. Doing this provides 2 main benefits. Firstly, some trainees will come to conclusion that the job is not for them, thus lowering attrition rates, and secondly, it provides the introductory questions base at face to face interview. It gives a real insight into our world, the calls, and shift working. This can also work for agents looking for additional activities or positions in the call centre, as talked about in this article on 20 Things Advisors Can Do to Improve the Customer Experience. A great place to start with developing a coaching culture is to have a small group of people who participate in a pilot of the scheme. This allows you to ‘iron out’ any changes before launching to the whole organisation. Pilot groups provide valuable feedback on how systems are working in practice, and allow any changes to be made before a wider launch. Pilot groups often become the biggest champions for successful projects and are of significant value when implementing wide organisational changes. I think all managers find they need to listen, and the type of listening you do and how you respond can both be forms of coaching. Communication is an integral part of being a manager and how you communicate can form a key part of coaching. Coaching doesn’t have to be a formal meeting at regular intervals. Coaching conversations can take place anywhere, any time, for any length of time. In fact, sometimes the most effective coaching conversations can be the shortest. Take time to schedule informal conversations, as suggested in this article 10 Great Conversations to Have With Your Contact Centre Team. In the areas of people skills and team working, it may be useful to partner with other similar-sized companies in the same area as you. Staff from each company could attend, with costs being shared proportionately. Skill-up line managers to deliver training to small groups of their staff on key topics that will improve productivity. It has the added advantage that people get to know their team mates better. Improve the skill set of your managers, by taking a look at this article. Provide a library of books and DVDs that people can use to increase their knowledge in their spare time. The company could make an initial investment and the collection could then be grown through setting up your own version of BookCrossings. Start lunchtime learning sessions where staff can elect to deliver a session on their topic of choice. Even if the topic isn’t work-specific, you’re giving staff the opportunity to see a different side of their colleagues, and the person delivering the session is able to share their energy and enthusiasm for something they’re passionate about. Great for upping the energy levels. Great for engaging staff. Ensure you have committed resources for training and development; training not only nurtures technical ability but also increases staff engagement, helping to motivate and retain talent. When thinking about training, look closely at what skills are needed within your team. In a customer service call centre, training will often focus on product knowledge, complaint management or questioning techniques in first-call resolution. In a sales-based call centre, training will also focus on ensuring employees are able to advise customers on the best-fit product or service. Read this article with our Top Tips for Induction Training Programmes, for tips on engaging agents during induction. It is crucial to understand that training is an ongoing process; as markets, the business or products change, additional training will be needed. Refresher training is a great way to deliver additional training to working agents. Find out more about it by visiting our ‘Answers’ page that discusses refresher training options. Whilst every agent in the contact centre will be using the same software and equipment, each one will have different skills and personality. Training should reflect this, developing their skills without over-emphasising any one particular area. Training needs to relate to the job at hand, so why move people away from the place they’ll be working in? If possible, incorporate relevant training into the working day, into the tasks and activities agents have to complete whilst dealing with customers. Online training tools can also be incorporated, freeing people from the classroom and indeed the training centre and allowing training to take place on a genuinely ‘as needed’ basis. Take a look at the Best Uses for e-Learning in the Contact Centre. The idea of speed training is based around engagement of staff in the call centre. This has been invented purely for the call centre market. Involves games/activities which develop voice skills, customer service, etc. It’s not so much a tip, but rather a form of training. We have created an online training simulation for a major US telecoms company, to train their staff in call handling, whether that be retention, troubleshooting or sales. Effectively, agents can train at their desks in chunks of approx 15mins, making decisions based on their ‘virtual’ customers’ responses. At the end of the ‘virtual’ call, agents receive feedback on their choices, comparing the route they took for the call to the ideal route. All feedback can be printed out, allowing agents to refer to the documentation every time they have a similar real-life call. One thing I believe is very important before any training is that you have to be sure everybody understands why they are there. You have to understand that the call centre environment is NOT for everybody before you provide training and then have recruits leave two months later when they realise it is not for them. When recruiting, don’t just talk about how good it is work with you, but get the candidate to listen to a good call, an average call and a really bad call. Talk about the bad days and what it is like to spend 6 or 8 hours on the phone, and when you are on your 120th call while it is your customer’s first contact with your company. After they understand this, you can train them in whatever you want. I have experienced being on the team of a start-up call centre where “call centre culture” was not known. As a trainer on a combination team of operations, recruiters and trainers, we trained for six months with new classes every three weeks. This time period gave the opportunity to integrate new methods, techniques and strategies to improve and deliver a better product and process. Don’t minimise the initial training time to save money. Efficient use of time in training is essential. In other words, make every minute count. Eliminate exercises that don’t add value to the trainee, program, or client. Utilise the time in training by integrating the new information with practice. Be flexible within the classroom. Employ different learning methods for different situations and utilise leadership. This often requires a prepared, experienced, connected trainer. Tracking new-hire classes for retention and performance should be done in order to improve the training curriculum and content as well as to place emphasis on the value of the training experience. Often trainers are guilty of standing and delivering material and not thinking of the impact of the training experience. Rarely have I seen the training department accountable for the retention and performance of new hires. This is a must. Take a read of this article, for more on developing your coaches and trainers. Often there are gaps in this process. The success of the training class often hinges on this transitional period. Even if the training class has experienced “on job” practice within the initial training period, the transition to “real time” is sometimes a black hole where momentum and often employees are lost. Many companies make the transition time a joint effort between trainers and subject-matter experts. This may be done by periodically handling calls on the Operations floor, or it could be done by helping supervisors with operational tasks. Monitoring quality would be an excellent way of support, and trainers must be involved in calibration sessions with Operations in order to make sure that quality is maintained. For more information on how to get a better quality performance, read this article on How to give Feedback, Training and Coaching. I can not emphasise enough quite how important it is to include the training department as part of the Operations Team. Trainers deliver a product that supports the production of the Operations team. Training is ongoing. The training process should be a tool that is used often and assists in the success of the entire centre. Handling calls during the initial training session is an activity that can not be eliminated from the curriculum. This is what new hires were hired to do. Often either the equipment within the classroom doesn’t allow new hires to handle these calls or individual equipment is not available for handling calls on the production floor. Maybe volume is so heavy on the call centre floor that the new hires are asked to eliminate a session of call taking due to seating shortages. It is imperative that the new hires receive practice handling real-time calls. There is no substitute for this experience. Role-play is good, but real call handling is essential. Trainers should make sure that equipment in the classroom works and is available for each “real-time” call handling session. Operations should make this a priority. It is imperative that the new hires receive practice handling real-time calls. There is no substitute for this experience. AO have a “Rookie Pod” with helpful posters on the walls, to ease their new recruits into the contact centre floor. Read more about this here. Create a buddy system, which incorporates staff who behave well and portray values that you want future recruits to imitate. So, let new staff watch what they do and get them to help new staff on their initial calls once a relationship exists between them. This will help improve agent performance and also agent engagement. Take a read of this article on Being Super-Busy: The Modern Excuse for Not Coaching Staff. Allow your agents to listen to their own calls. When working on a coaching objective, you can also, after the initial coaching, get them to give you a call where they believe they have been able to implement that coaching. Running through this process will result in the agent actively thinking about the coaching objective, which will help them to embed the training into every call. For example “Tell me of a time when…” Ensure HR, Training, and Operations agree on the Orientation, Aptitudes, Attitudes and/or Values to be screened for. And then stick to them. So there needs to be a healthy balance between satisfying headcount and employing the right staff. Ensure the curriculum has no fluff – that it teaches only need-to-know knowledge/skills. Ensure the curriculum has very little lecture but is mostly practice. That is, the curriculum should be interactive and engaging. Learners should NOT be idle – they should be doing. Read more about interactive inductions, by reading this article on What Does a Good Induction Programme Look Like? Trainers should collaborate with each other to ensure best practices of learning strategies and methods are also included in curriculum. Include Level 1 and Level 2 evaluations. Learners’ experience in the classroom should match their experience on the floor as closely as possible. Operations and HR should help to fill in gaps in the classroom – to set appropriate expectations of life on the floor. This means metrics for a day-0 rep should be determined and incorporated in the performance-based test. You should also create a seamless transition from classroom to floor. The above points should create no surprises for reps or Operations. Hosting graduation ceremonies for agents helps start them off in a positive mood, and continuing this for those who have increased their skill set helps maintain a positive culture. Ensure any training sessions are short and sharp to keep agents focused, as holding their attention is just as important as the content itself. Where content is detailed and will lead to a longer session, try to ensure regular breaks to avoid overwhelming your trainees. 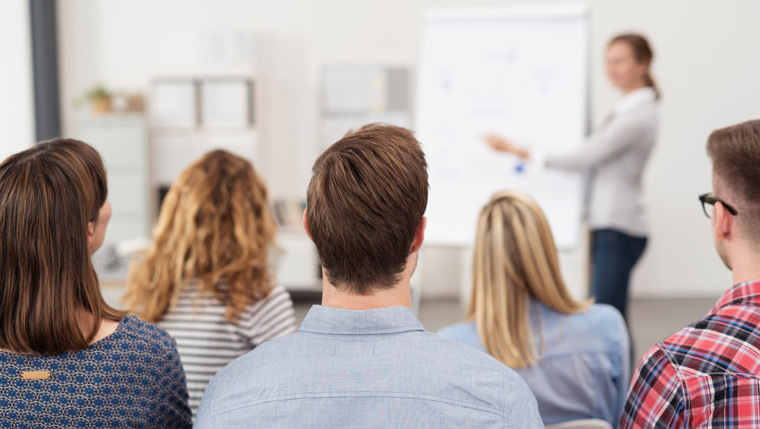 It is also important to make sure the trainer is engaging and doesn’t hide behind a PowerPoint presentation, as these have the potential to kill a training session in its tracks. Before graduating from a ‘learning bay’ be sure there is a hand-off and agreement between the supervisor and trainer. If there are issues – the trainer should keep the CSR for another week and then if it is still not working, kick ’em out the door. Supervisors should see the stats and understand the good and bad of associates. Once the supervisor accepts responsibility, they are on the hook to some degree. Be sure they put their business hat on versus emotional hats when dealing with frustrating situations. Identify the core competencies that are most important for the role and where your target audience is within this framework. The more important the competence, the more important it is that you focus training time there. If there are huge disparities between delegates, you can run courses at a different levels, but be careful not to label people as “good” or “poor” by doing so. When a call centre rep is on the phone, nothing breaks concentration more than involved processes. Everything must be done with multi-tasking in mind if the rep is to be able to hit AHT/ACW/Sales goals or matrices. Simple processes, simple procedures, simple, easy-to-implement computer aids, all mean that training time is reduced and productivity increases. In my call centre, we focused on KISS or Keeping It (Training) Supremely Simple. By keeping the generalised training simple and focusing that training on versatility, we have increased the overall confidence while driving up productivity, and the training has played a key role in how quickly the call centre became profitable. Training in a call centre is at best generalised. Not every situation can be covered in training to ensure the rep is “fully capable to handle all situations”. So, all training has to be generalised; but generalised training has the tendency to remove the ‘human element’, thus service levels suffer. Adaptable training is conducted by supervisors on a one-on-one basis, with all the inputs for improving reps made by the rep after listening to their calls. I am not advocating removing “generalised training” from the curriculum, but adding the adaptable training to the weekly training session of the new reps and to the monthly session with experienced reps. Thus, through listening to the calls handled by the rep, individual strategic plans can be made, and personalised training can become adaptable to many different situations. Training should never be a once-in-a-lifetime thing. This is where adaptability comes into the workforce mix. Weekly sessions to hear the calls, discuss plans, and drive for improvements should be an integral part of the overall call centre experience. This has two benefits; it helps the reps see the need for constant upgrades to training while providing a forum to gain this training. This time also gives team leads/supervisors the time and forum to personalise training to fix training holes from the generalised training the rep received. If machinery needs periodic maintenance to keep in top running form, consider how much more periodic training the reps need to maintain efficiency and stay in top performance. This is how you can Prepare Agents for Team Leadership or offer Refresher Training Options. Phonetic speech search technology can be used on agent interactions to identify specific call issues, using keywords or phrases. Training needs for agents can then be quickly identified. Being able to analyse large volumes of agent–customer interactions releases information on specific calls with issues and trends across the whole agent population, creating the opportunity to coach staff using identified good examples to improve standards across the contact centre. The resulting information not only creates training opportunities but also enables refinement of scripts, improving the overall performance of the contact centre. Training feedback can be solicited by way of a training feedback form, end-of-the-program quiz and impact of training surveys. The feedback or evaluation process can cover the following features: quality of the programme, relevance of the programme, evaluation of the trainer and impact of training. Half-yearly and annual training reports can give an overview of all the training activities conducted during the year. They give quantitative data in terms of number of hours of training imparted and cost involved, together with qualitative data in terms of the programmes conducted, feedback received and an outline of the training activities planned for the next year. Our strategy for knowledge management is “Hone your skills to perfection and learn something new everyday”. This is because the only long-term competitive advantage for any organisation is the collective brainpower of its people. You can use this to create a coaching culture in the contact centre, read more about it here. Try to get actual customers to come in and contribute to a training session. The fact that customers are willing to take the time to do this is a good indication in itself, but real customers really grab the attention of the agents and team leaders! Do you have any other call centre training tips that you would recommend? If so, please share them along with any other thoughts in our comments section below. Originally Published on 18th November 2009. Recently updated. Excellent list of customer service training essentials and some new perspectives that advance service and training. I really liked tip #3 — bring in real world advice. Call centres and customer service departments thrive on knowing how to handle real-world calls in an authentic (non-scripted) manner. It sets them apart from the ordinary centre. Bravo and thanks for posting this. I will RT this URL on Twitter so many in service will access it and learn from it. A very comprehensive and useful set of training essentials, and indeed food for thought, I particularly like Point 41 about getting staff to learn prior to the induction, I would appreciate anybody elses views or examples of how this works, or how it is fitted in to the recruitment process. An excellent item and very useful. We are a training team of 3 here at a Local Government Contact Centre. Once trained our advisors will either go onto our training bank for support (anything up to 5 days depending on the area they have beeen trained in) or join their teams with support from their Senior Advisor and Team Leader. Support is ongoing with coaching and regular training needs analysis. We have learnt the lesson that the trainer’s job does not end at the end of the course! A great list! Another tip for trainers is to role model the energy you want from your group. Positive, enthusiastic trainers get better results than fed-up, boring ones! Thanks for the article. You bring up a great point about screening and analyzing both the trainers and and methodology. Training — effective call center training, is a process that requires an attention to learning styles and follow-up reinforcement. However, the investment is well-worth it when you see your customer satisfaction rates increase and gain loyal customers. This is an excellent article. Re: point #41, if you are not going to pay the new employees to take the training before they start working at the company, you will have some that complete the training on their own time and others that don’t. How do you overcome this disparity? Thank you for the tips. It was pretty good.